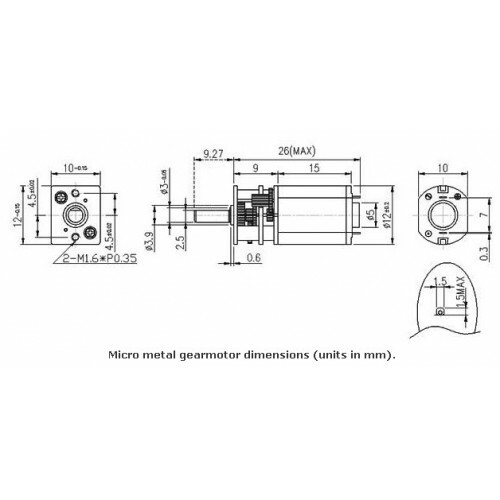 This gearmotor is a miniature (0.94" x 0.39" x 0.47"), high-quality, high-power motor with 100:1 metal gearbox, similar to Sanyo’s popular 12 mm gearmotors. 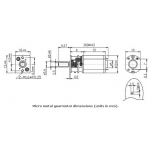 These units have a 0.365"-long, 3 mm-diameter D-shaped output shaft. This version also has an additional 1mm-diameter output shaft that protrudes from the rear of the motor. 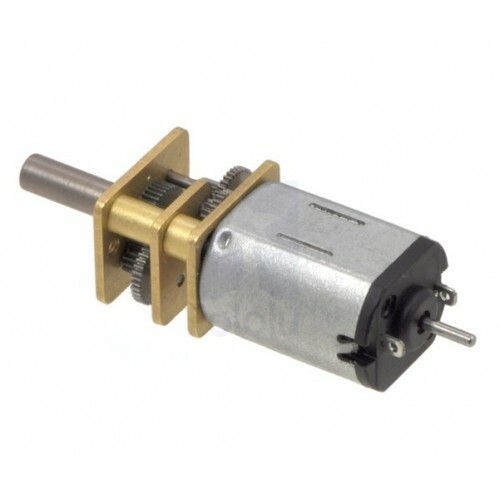 This 4.5mm-long rear shaft rotates at the same speed as the input to the gearbox and offers a way to add a custom-built encoder to provide motor speed or position feedback. Key specs at 6 V: 320 RPM and 80 mA free-run, 30 oz-in (2.2 kg-cm) and 1.6 A stall. These tiny, high-quality motors are intended for use at 6 V. In general, these kinds of motors can run at voltages above and below this nominal voltage, so they should comfortably operate in the 3 – 9 V range. Lower voltages might not be practical, and higher voltages could start negatively affecting the life of the motor. All of the micro metal gearmotors have the same physical dimensions, but they come in a wide range of gear ratios—from 5:1 up to 298:1 (we don't stock them all but can source from Pololu)—and let you choose between two different motors: high-power (HP) and standard.